Market day youth team fundraiser. Craft stalls, clothing, car boot sales, bouncy castle, face painting, quick fire raffles, food, games. Also, Medium Carin Anderson will be on site offering mini readings. Lots of fun to be had. 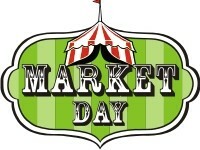 Stall and carboot spaces available at only $15. Come along and support our boys fundraising for Australian tournament in 2017. 3 minutes from Westgate shopping centre and 1 minute from the end of the North Western Motorway. For more information or to book a stall, contact Tracy at waitakere.smith@gmail.com.